In 1980 my daughter left Canada for the United States of America. She already had a Bachelor’s and a Master’s Degree in 17th Century French Literature from UBC at the tender age of 23, but finally she was ready to leave home to pursue her doctoral studies. From the list of universities which had accepted her into their graduate program she finally chose Stanford University in California. During her time at Stanford she met an Italian graduate student and when they had both finished, after six long years, they married and settled in the USA, firstly still on student visas and then work visas but eventually they obtained the coveted “green card” as it is commonly known, or Lawful Permanent Residency. Finally, after 19 years in her case and 20 years in his, her very pragmatic husband thought that it was time for them to become citizens of the USA, so that they could eventually enjoy some of the benefits for which they were paying large amounts of tax but which were available only to citizens. I think my daughter saw the wisdom of this and so the process was started. After many months and final interviews the process was completed, save for one thing, taking the Oath of Allegiance for Naturalized Citizens. At this point, I started to receive frantic telephone calls from her. She did not care for the wording of the oath at all. Not one little bit. Now this child of mine at that point held two citizenships, Canadian and Australian, with passports of both countries. The Americans were aware of that and said she could continue to hold those citizenships. It seems the USA is a little schizophrenic on the topic of dual citizenship. 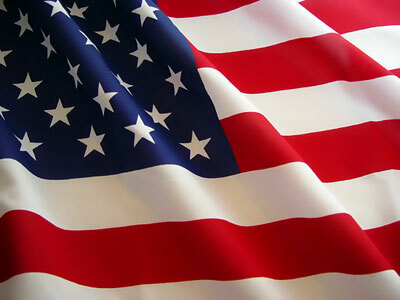 It used to be the case that US citizens could not hold dual citizenship, except in certain specific cases. However, most of the laws forbidding dual citizenship were struck down by the US Supreme Court in two cases: a 1967 decision, Afroyim v. Rusk, as well as a second ruling in 1980, Vance v. Terrazas. On the other hand, if an American takes up citizenship in another country, then the US will consider that person to no longer be a citizen. Incidentally, the same is not necessarily true the other way around. If a person of another country becomes a US citizen then, depending upon the laws of the home country, that country may still consider her/him to be a citizen. However the official US State Department policy on dual citizenship today is that the United States does not favor it as a matter of policy because of various problems they feel it may cause, but the existence of dual citizenship is recognized. But for all intents and purposes dual citizenship is accepted totally now in the USA. So what was the problem for my daughter? Why was she freaking out about taking the Oath? Well just take a look at the wording. That is pretty strong language indicating that you are certainly renouncing any citizenship you hold when you take the oath, wouldn’t you say? She had been frantically looking online to make absolutely sure that she was not giving up her Canadian or her Australian citizenship by swearing this oath. I suggested that the oath was simply anachronistic in light of the fact that dual citizenship for US citizens has been in effect for quite a few years, and that it had not been changed to keep up with these changes. It does seem strange that changes have not been made to it. Well she did take the oath and she has applied for a US passport and so in the tradition of our immigrant family, another one has officially changed citizenship. But I think, like me, she will retain the strong attachment to the land of her birth. She will always be a Canadian. As I asked in the linked post, where will my granddaughter end up, she of the three citizenships, American, Canadian and Italian. Will she continue our immigrant experience by living elsewhere? Time will tell. Once again I was scratching my head about this one. It seems I don’t take photos of flags. But then I suddenly thought of the perfect idea for this theme, although I’m afraid I had to scan in these very old photos (taken in 1984) and they could do with some “editorial” help if only I was good at that. 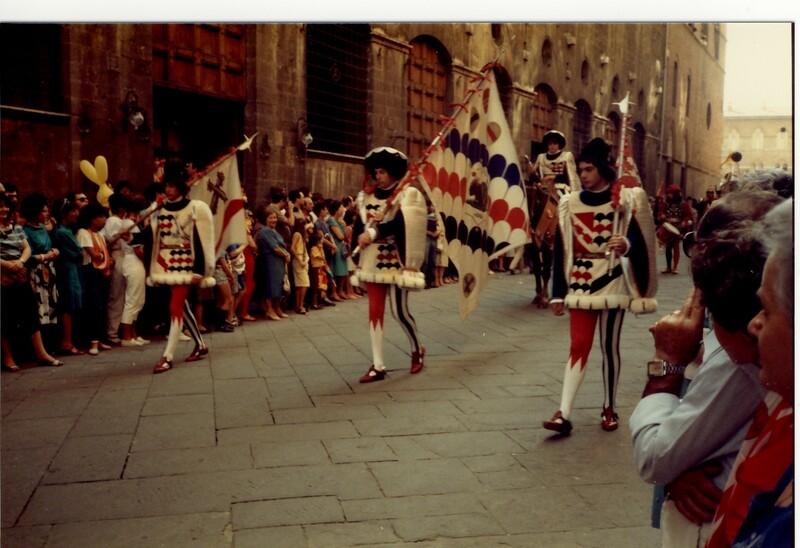 These photos were taken in Siena at the running of the Palio di Siena which I wrote about so long ago. 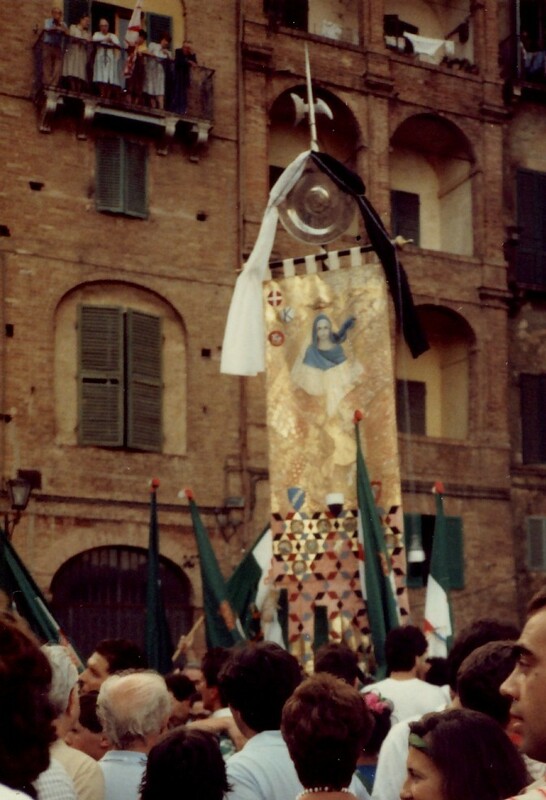 It is a horse race between the various contrade (zones) of Siena, taking place twice each year since the 1600s and the prize is the Palio, a banner which hangs in the clubrooms of the winner. Click and you will get a very big view! I forgot to reduce it in size before uploading. Before the race there is a parade with everyone in period costume, and many carry the flags of their contrada. We have a close friend from Siena and he belongs to the Istrice contrada, or Hedgehog contrada and this is their flag above. Well this is not exactly a flag but it is flag like and it is the banner which was made for the Palio we attended in 1984. Tuesday is usually a golf day for the Old Scientist but today his partners were not available, so I suggested we go to Steveston for walk on the dyke, followed by lunch on the Steveston wharf. 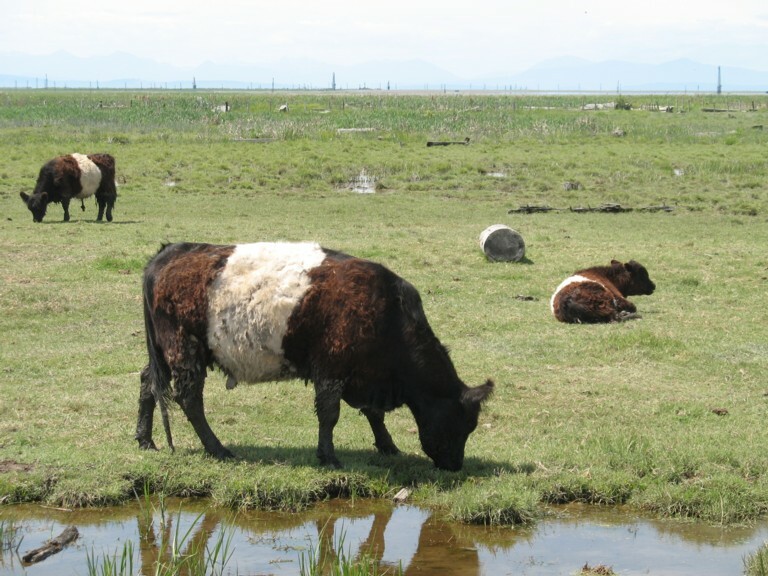 Along the way we saw my favourite Belted Galloways, enjoying the fresh grass which grows in the tidal marshland adjacent to the dyke road so, as usual, I took a few photos. Yes again. Please endulge me. 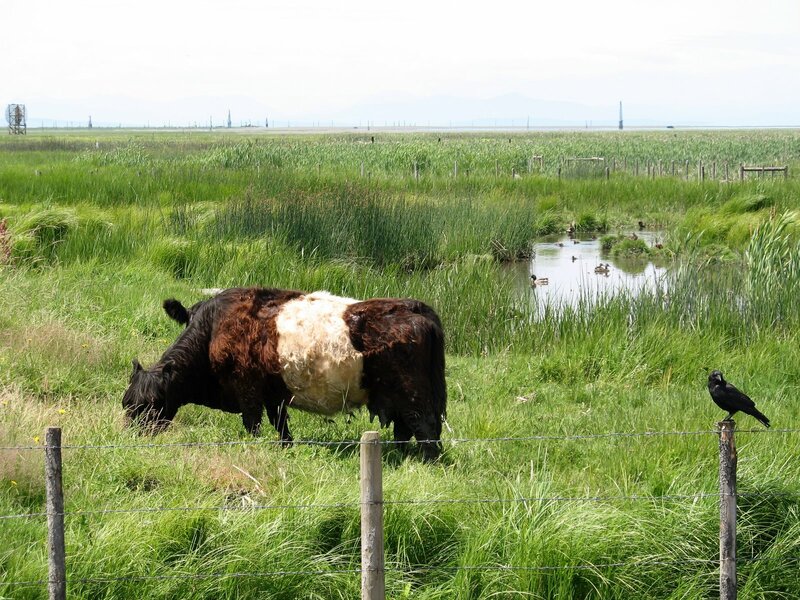 The Belted Galloways of Steve’s farm spend the summer grazing in a paddock fenced off from the rest of the marsh. For the first time I saw a box by the fence which contained pamphlets with information and inviting you to place your orders for frozen beef from these lovely cows. Luckily I am not a farmer else they would all die of old age. 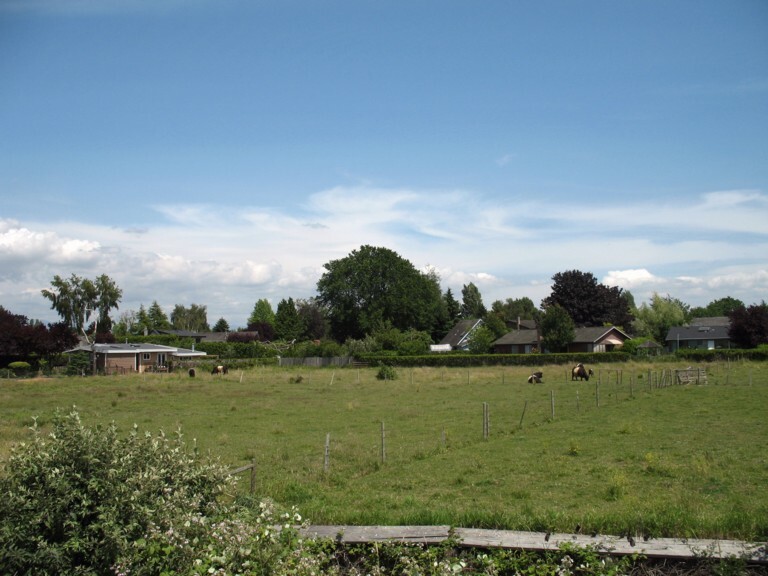 According to the handout, these cows are pastured on grass during the summer and are fed local hay and ranch alfalfa during the winter, with their diet supplemented by barley mash from the beer brewing process of a nearby brewery. 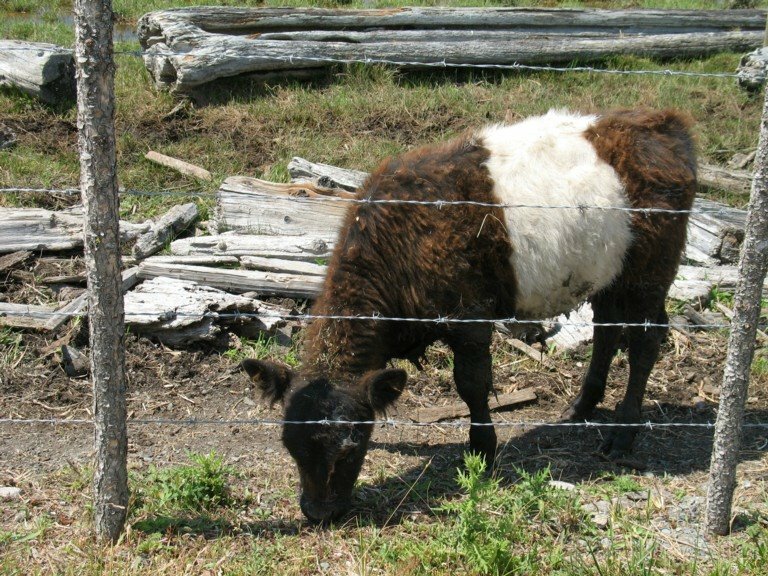 Because of their thick coat of outer hair, these animals have reduced outer body fat and lean tender meat. 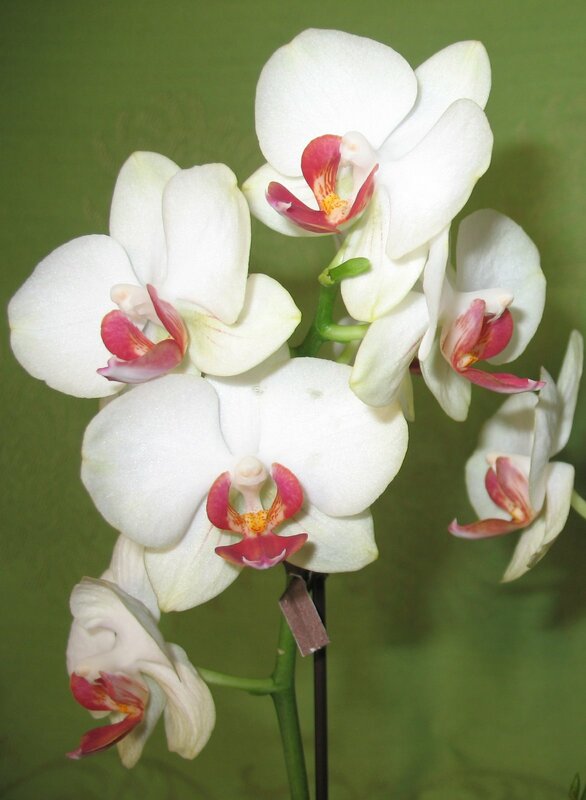 They are all raised from birth by the Steve family and receive no growth hormones or antibiotics. I counted 21 animals in the field today, at different stages of development. I’m afraid that they have all been sold this year but you can place your order for 2010. A side of beef, approximately 160 lbs, will cost you $800, cut, wrapped and frozen. No I am not a vegetarian and I eat beef, but these animals feel special to me so I won’t be placing my order any time soon. Not all the animals were in the soggy field nearest the river. 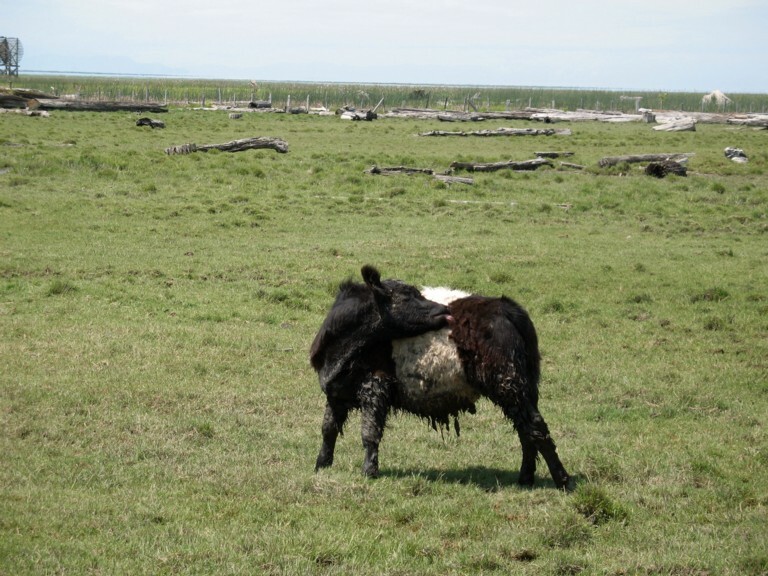 Some were still in the drier fields on the land side of the dyke, where the herd spends the winter. 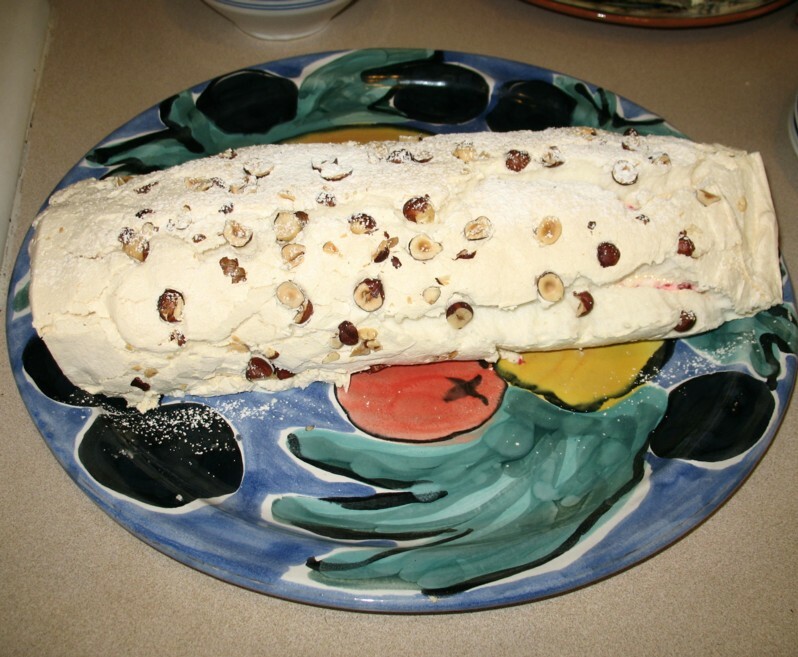 Click to enlarge the photos to see them more clearly. Our hostess, tn chick, is making things more difficult for us each week! Creamy??? would not exist in the English lexicon.